Cooking in someone else's kitchen: Unwontedly. It was late June. Well, OK, I was on a bus, not a train, and it was a scheduled stop rather than an unwonted one, but it was still a pleasant surprise to find myself in Banbury today, an Oxfordshire town I once lived near. I was on my way from Heathrow airport to Birmingham on another UK jaunt. 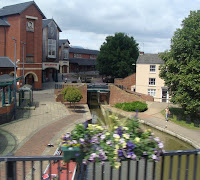 It has been 20 years since I've been in Banbury (famous for its cakes and its cross) and I hardly knew the place, with its redeveloped canal-side shopping centre and bus station. Funny how you expect old haunts to remain the same while you move on yourself. So I'm now in Birmingham, the second-biggest city in Britain; a location so vastly different from rural Ontario that being in it is almost as disorientating as trying to recognise the redeveloped Banbury. 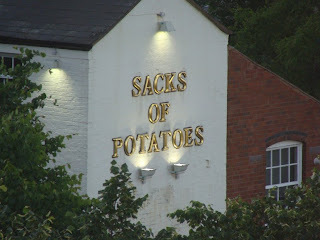 But then I noticed the name of the pub that is visible from my hotel room and felt more at home. Does that describe the shape of the punters?